easyGUI comes with a number of text fonts already included The easyGUI fonts are designed to be used in a variety of different interfaces, supplemented with specially designed Icon fonts, they will be more than sufficient for the target system. But in other cases additional fonts in specific sizes/formats, or covering some special characters not found in the supplied fonts, are required. This is why we develop individually designed custom fonts. Both Unicode and ANSI. 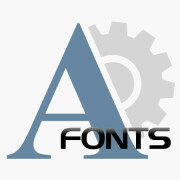 These font are of the highest quality, and made to look their best when working with easyGUI. They are designed from scratch, and each character’s PS markings have been tested.